I seriously can’t believe summer is almost over. My kids go back to school in 2 weeks. Only 2 more weeks of lake days and late night ice cream runs and sleeping until 10 am. In honor of school starting back, I’ve agreed to host a sleepover for my kids. Reminder: I have 3 boys under 10. 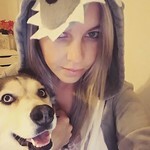 They have lots of friends. Please support me through this. So we’ve decided to watch Captain Underpants: The First Epic Movie at this sleepover and I won’t lie, I’m as excited as the kids. I read the Captain Underpants books with my oldest for the first time years ago and have read them numerous times since. The Captain Underpants movie is available for preorder now and would be perfect for a back-to-school movie night. The movie is all about the friendship between Harold and George and the connection they form through their love of writing and creativity. The outrageous humor is exactly what all of us need during the hectic back-to-school time. 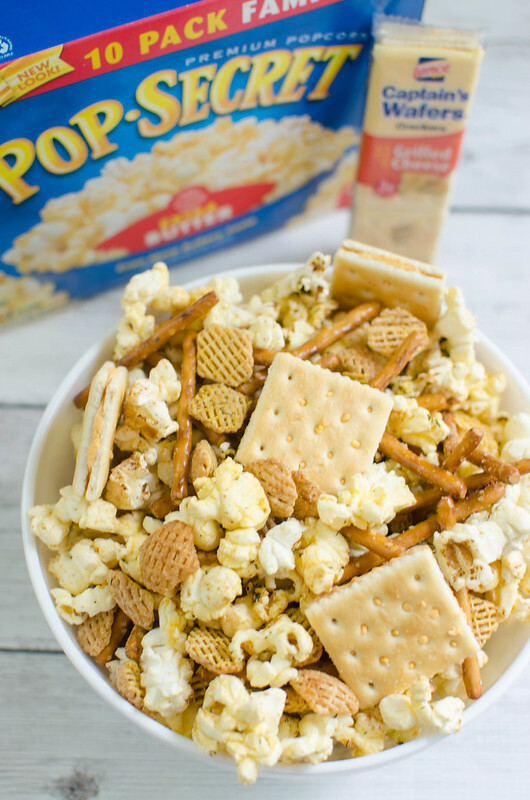 Now let’s talk movie night snacks! Everyone in my house is obsessed with this Dill Pickle Popcorn Mix. I’ve made it twice in the last week and will definitely be making it again soon. It’s super easy. 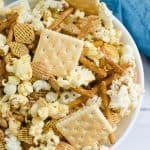 It starts with a bag of my favorite popcorn, Pop Secret that I picked up at Walmart along with the rest of the goodies for this recipe. It has the most delicious butter taste and I love that it’s a high-quality snack that I feel good about sharing with my family. So take that popped back of popcorn and toss it with some pretzels, and some cereal and then it gets covered in a delicious mixture of dill pickle juice, dried dill, garlic powder, and dry Ranch dressing season. Then you just have to bake it for 30 minutes, let it cool down and add your Lance Grilled Cheese crackers. Those Lance crackers are my kids favorite lunch box snack. I buy them every week of my life. I love that they’re made with no high-fructose corn syrup, they have real cheese or peanut butter, and they’re just overall a great snack solution. Plus, they’re filling and portable which, as a mom of busy boys, I appreciate. 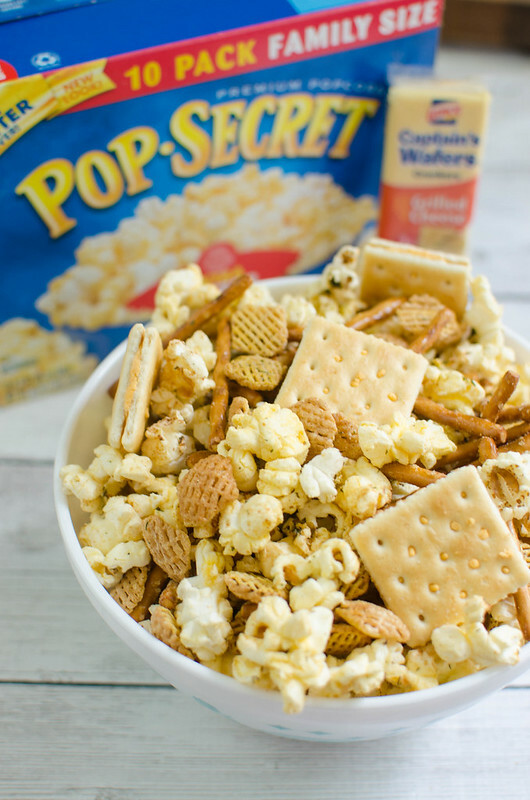 Aaaaand, they’re perfect in this snack mix! Make this for your next movie night, for school lunches, it’d be great for any occasion. 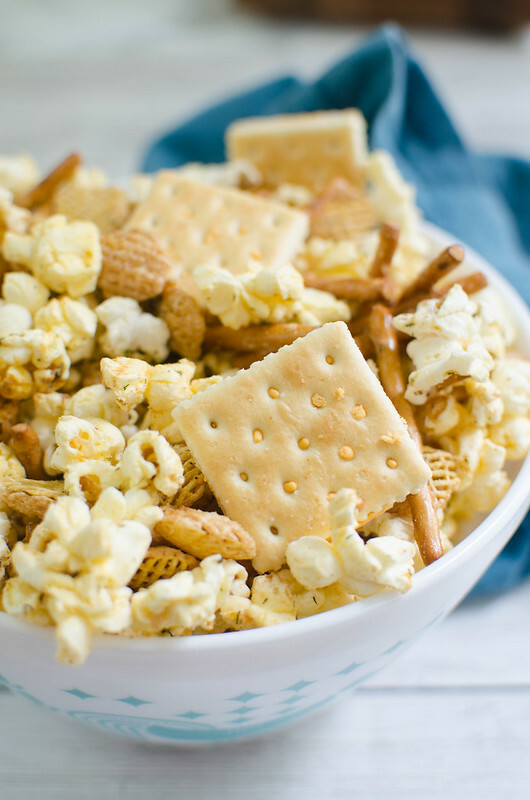 Do you have any popcorn recipes that you love? Favorite back to school snacks? Let me know in the comments! I’m always looking for new ideas! Preheat oven to 300F. Line a rimmed baking sheet with parchment paper. 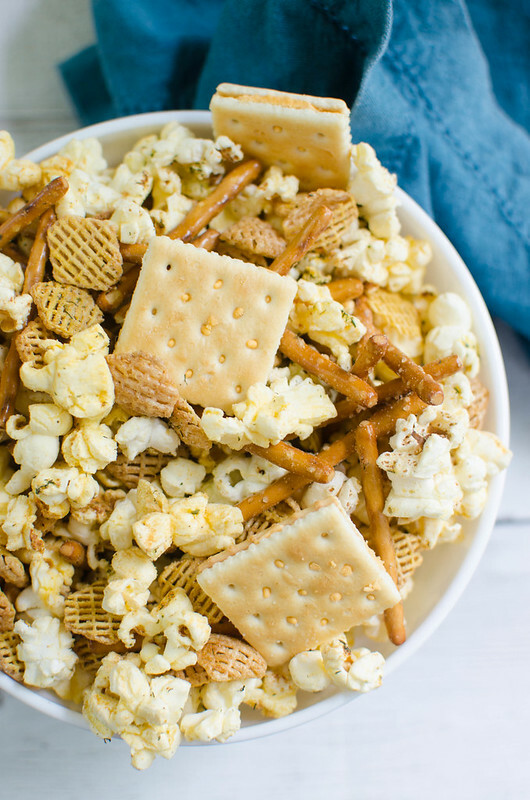 In a large bowl, toss together popcorn, pretzels and cereal. In a small bowl, whisk together oil, pickle juice, dried dill, and garlic powder. Drizzle over the popcorn mix. Sprinkle with the dry Ranch dressing mix and toss to coat everything. Bake 30 minutes, stirring after 15 minutes. Cool completely before adding the crackers and serving.